Did you ever wish you could have coffee with some of the most successful young women entrepreneurs? Get a peek into how they face challenges, find the courage to strike out on their own, cope with daunting workloads and doubting family and friends? Well, now you have the next best thing. 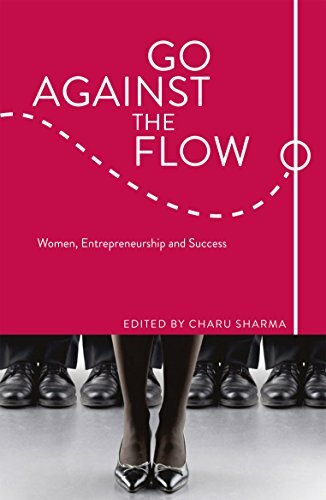 In Go Against the Flow, the book, Charu Sharma brings together some of the most daring young women who are making their marks in fields ranging from robotics to medical technology to dance. They include Noor Siddiqui, founder of Remedy Inc., a start-up that harnesses the latest technology to help healthcare practitioners better communicate; Sarah Wood, founder of UnrulyMedia.com, the leading global platform for social video marketing; and Annie Ryu, founder of Global Village Fruit, a company that is helping communities gain value from produce that would otherwise go to waste. While some of the contributors boast Ivy League MBAs, others are college drop-outs; some have bootstrapped their companies and others have appeared on-- and won-- Shark Tank.